The project challenges the notion of summer vacation by exploring the idea of living in the open. 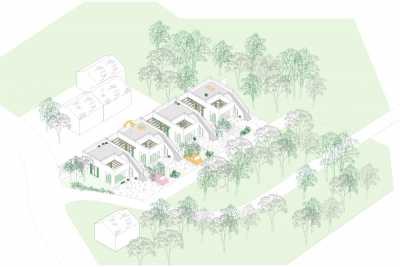 Housing units consist of minimal enclosed space and several open and semi open areas, in this way blurring the boundary between habitable space and its natural surroundings. The ratio of open to enclosed spaces achieved is 3:1. 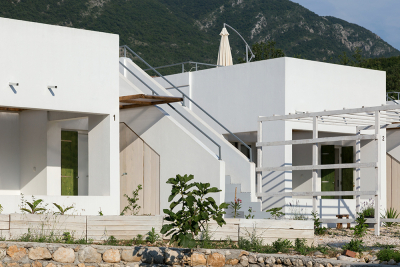 Four summer houses are nestled in the rocky foothills of Montenegro mountains, just a few kilometers away from the Adriatic sea. They are built on one half of already occupied lot, and are oriented opposite of the existing buildings, to maintain their privacy. 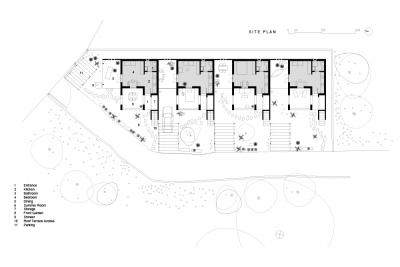 Each of the four vacation units expands its livable volume beyond its solid boundaries, occupying the open spaces within the surrounding wild greenery. Empty spaces in-between allow for the interior areas to open to the front and side, in this way enabling natural circulation of air and penetration of diffuse sunlight deep into the rooms. 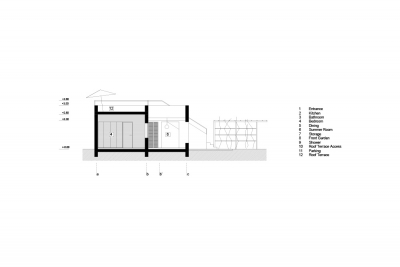 Enclosed spaces consist of one room, bathroom and small kitchen, and the exterior areas encompass a vast summer terrace for dining in the open, summer room for sleeping under the sky during warm summer nights, and an open roof for sunbathing during the day. Immersive atmospheric experiences achieved by subtly varying spatial conditions significantly improve the quality of everyday life, and most importantly, were not conditioned with limited budget that was available for the construction. 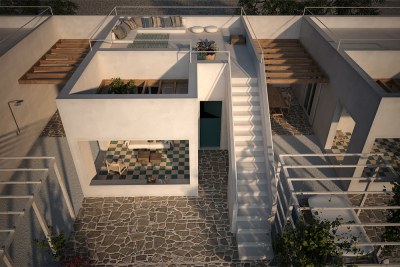 Material palette is simple and reflects local Mediterranean lifestyle. Both low budget and strict building regulations (minimal site occupancy), combined with the client's wish to have as much space as possible for renting, influenced our design strategy to turn the building inside-out, and to directly engage the architecture with its lush natural surroundings. In this way, both enclosed and open spaces are designed to be inhabited. 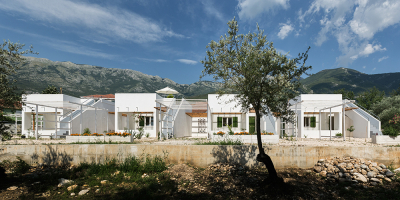 Moreover, by building on the existing qualities of the site - local weather conditions and wild landscape, the houses offer their users simple and natural spatial luxuries, completely unconstrained with low construction cost. Blurred boundaries and intertwining spaces create gradients of privacy, from shaded and secluded interior areas to exposed panoramic roofs. The building can function as 4 individual vacation units, as well as one dwelling with a series of open spaces for socializing. 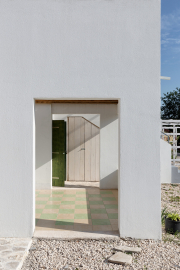 Unlike a traditional vacation house where people tend to separate into small groups and occupy individual rooms, the intertwining spaces create scenarios for spontaneous socialization among neighbors, resulting in unforeseen everyday situations, experiences and friendships. 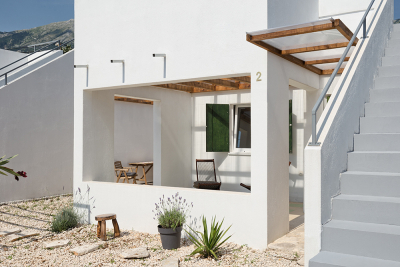 The applied materials are simple and locally available - white painted walls to catch sunlight and express spatial depth with strong contrasts of light and shade, solid wood for lightweight canopies and window shutters, and local stone and gravel for landscaping around the houses. Mediterranean planting such as olive, fig, cherry and pomegranate trees, oleander, lavender, aloe and rosemary have yet to grow and fully permeate the site. The invisible spatial links achieved throughout the housing complex - visual, acoustic, olfactory and thermal - enable all the individual atmospheres to mutually overlap and amplify each other. 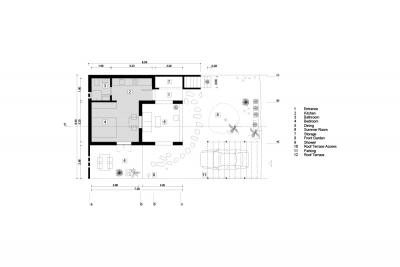 Open dining areas, between the neighboring houses, are oriented east-west, so that the sun reaches the space both at the beginning, and in the end of the day. They are protected from the prevailing winds, and overlook the wild landscape in the west. Summer rooms in the front are sheltered from frequent rain showers with transparent polycarbonate roof, but visually open to the sky and zenith sunlight. 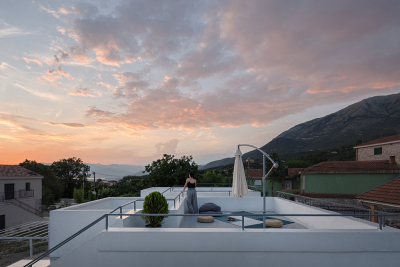 The roof terrace is exposed to the weather, offering clear views of wild vegetation, rocky mountains, sea horizon and the Island of Flowers ahead.